Just add water. It's automatic, easy to use and costs only pennies a day to run. After adding the seeds, the sprouter delivers a continuous supply of fresh water and air to provide a simple, convenient way of growing fresh, tender and live sprouts in the convenience of your own home. Sprouts have a high concentration of proteins, vitamins, minerals, enzymes and maximum nutrition in a small package! NEW Features of the Freshlife 3000! Sprouts are baby plants in their prime. According to experts, at this stage of development they have a greater concentration of protein, vitamins, minerals, enzymes, bio-flavinoids, T-cells, etc. than at any other point in the life of the plant. There is virtually no loss of nutrients because they are eaten the day they are picked. You can enjoy fresh sprouts at any time of the year. Just add water and seeds! No soil, no special light, or green thumb required. Seeds can sprout 7-15 times their weight, which makes them very economical to grow. FreshLife Sprouter is for indoor use only in room temperatures of 64°F to 85°F(18.0°C ~ 29.4°C) for the sole purpose of growing sprouts and cereal grasses, and for no other purposes. 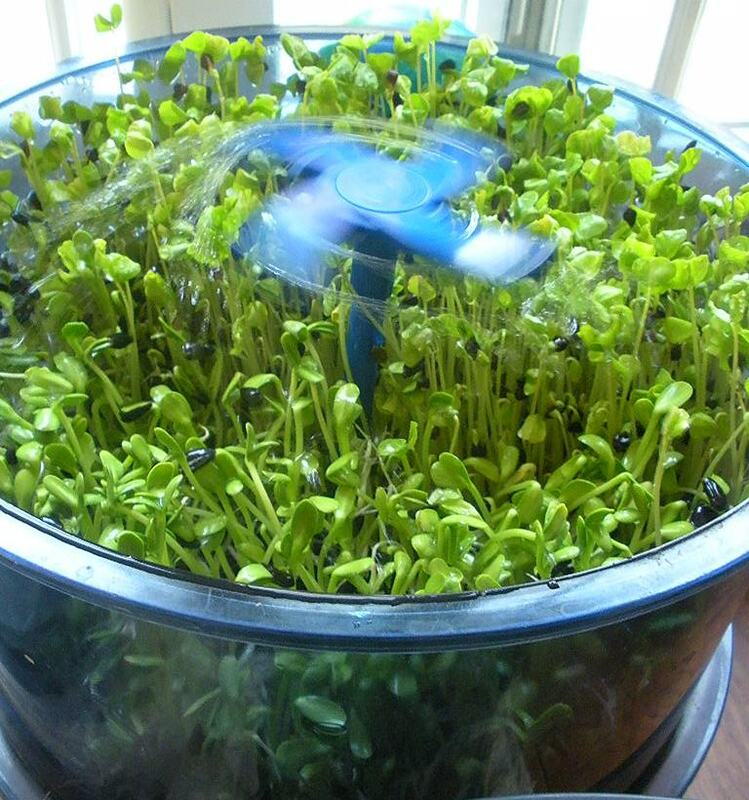 FreshLife Sprouter features an automatic sprinkling system to produce fresh, nutritious and tender sprouts. FreshLife Sprouter is inexpensive to operate and easy to clean. FreshLife Sprouter enables you to enjoy nutritional natural food all year round. 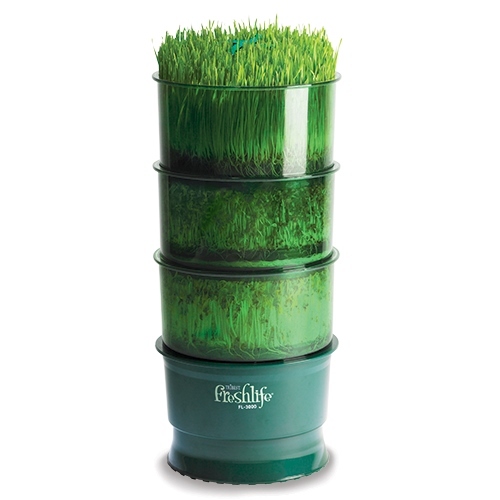 FreshLife Sprouter enables you to grow your own nutritional sprouts and wheatgrass! Wheatgrass has been proven to be one of the most nutritional foods on the earth. 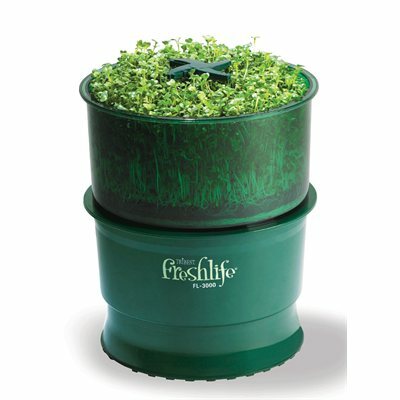 FreshLife Sprouter is expandable to allow you to grow 3 times the sprouts! 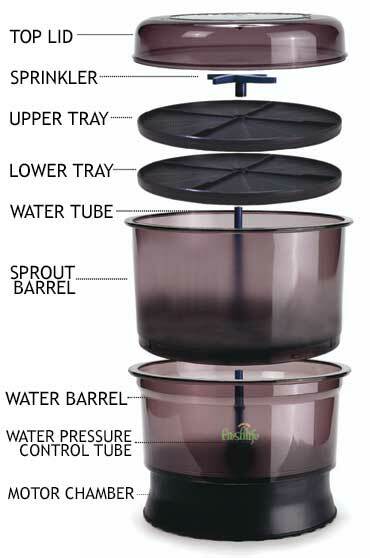 Just purchase a second or third sprout barrel from us to double your sprouting area. No other tools are necessary; just add the second or third barrel on top, place the seeds and plug it in...it's that simple! The expansion optional kit includes an extra barrel, top and bottom seed trays, the water tube assembly, and three stainless steel clips for support. The actual products and parts may be slightly different from the pictures shown above as a result of design improvements on the manufacturer's behalf. This is rubbish. Don't waste your money on this machine. I used it just for a few months and the motor is out of order. In addition, most sprouts rote, except for the mung beans which delivered great sprouts. - Please note that this review is for the older Fresh Life 2000 which was discontinued over 4 years ago. Hi Louise, we went back and checked which model you had ordered from us and it looks like your order was from over 6 years ago in 2012. You had ordered the Freshlife 2000 model which was discontinued in 2014. This model was replaced with the Fresh Life 3000 - which has a new improved powerful motor. We haven't had any issues with the new model and this is a best seller for us. We use it ourselves, bring it to many health shows and grow sprouts at the shows with no issues. Please make sure the water is replaced daily and that the sprouter is placed in a cool location away from direct sunlight for best results. Also some maintenance is required to make sure there is no buildup in the tubes or motor. We recommend purchasing a straw cleaning brush which we sell for a few dollars to clean the parts every month. The motor also comes apart very easily so you can clean it. We also recommend running it empty with only hot water every so often to help keep it clean. Thanks for the review and hope this helps customers make an informed purchase.